BEIJING, China (CNN) -- Fireworks, athletes and pageantry on a scale never before seen in the Olympics opened the Summer Games in Beijing on Friday as the Asian nation kicked off the biggest and most scrutinized Games in history. Fans celebrate the Opening Ceremony of the 2008 Olympic Games in Beijing, China, on Friday. Chinese President Hu Jintao declared the Olympics officially open, retired Chinese gymnastics champion Li Ning was carried through the air to light the Olympic cauldron, and pyrotechnics exploded throughout Beijing as the crowd of 91,000 at National Stadium cheered wildly. It was a stunning display from the nation of 1.3 billion people. Some media observers believe that the Opening Ceremony may be the most-watched television event in history. IOC President Jacques Rogge spoke of China's long-held ambition to host the Olympics. "Tonight, that dream comes true," he said. Rogge mentioned the Sichuan earthquake, saying the world was moved "by the great courage and solidarity of the Chinese people." The ceremony began at 8 p.m. local time (8 a.m. ET) on the eighth day of the eighth month of 2008 -- in a country where eight is the luckiest number. The opening was an artistic mix of performance and light depicting China's 5,000 years of history. Fireworks shot off across the Chinese capital as thousands of drummers, acrobats, martial artists and dancers performed under a light display at the National Stadium. Children representing each of the 56 ethnic groups in China marched out into the stadium, called the "Bird's Nest" because of its notable appearance. Delegations from Afghanistan, Taiwan, North Korea and the United States were welcomed by huge cheers. 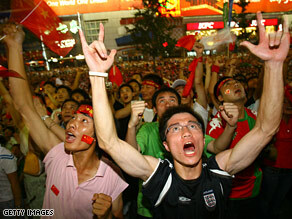 But the loudest roars were saved for the Chinese participants. Waves of emotion greeted China's delegation as it entered National Stadium, led by flag bearer and basketball superstar Yao Ming. U.S. President Bush was joined by Russian Prime Minister Vladimir Putin and more than 100 heads of state, heads of government and sovereigns expected to attend, the International Olympic Committee said. The joy in Beijing was countered by grave news in Europe. As the Opening Ceremony was under way, Georgia's president said that his country was under attack by Russian tanks and warplanes. While in Beijing, Bush and Putin met to discuss the conflict. For some world leaders, the decision to attend was a tough call. French President Nicolas Sarkozy threatened to boycott the Games because of human rights abuses in Tibet but later changed his mind. "It's inevitable that people from different countries may not see eye to eye," Hu said recently, "so we should try to expand our common ground on the basis of mutual respect." Political leaders do not attend Olympic opening ceremonies as a matter of protocol -- Bush is the first American president to attend them outside the United States -- but China seemed determined to have as many there as possible. "They want those leaders to confirm the fact that China has returned to great power, prominence in the world," said David Zweig, a political analyst at Hong Kong University of Science and Technology. On Sunday, swimming competition begins, along with U.S. swimmer Michael Phelps' quest to win eight gold medals, more than any individual in a single Games. Even if he fails, Phelps could become the all-time leader in gold medals. CNN's Kevin Drew and Emily Chang contributed to this story.